Know: Identify the characteristics of a unified church, contrasting the ideas of unity versus uniformity. Feel: Experience the blessing of belonging to a unified worldwide spiritual family. I chose to use the quotation above out of the Teachers Edition to highlight the contrast between the week's visible lesson and the SDA church's objectives for it. The real goal of this week's lesson is that the people reading it will join the SDA church. They identify themselves as the only true church, so it only makes sense that you would join them as opposed to any other Christian church. I don't think I am misreading or misinterpreting the statement “unite with some local Christian fellowship.” Has Adventism embraced the idea that children of God exist in a Church of Christ, World Wide Church of God, Baptist, Reformed or any other fellowship? Do they allow people to worship on any day of the week? No, the seemingly generic “Do” statement above can only be interpreted as a local Adventist fellowship. By contrast, Saturday's overview rightly states, “The church owes its existence to Jesus Christ. He is its Originator.” (Standard Edition Page 64) What does Jesus Christ have to do with any given denomination? Nothing. However, he has everything to do with individuals within all the various denominations. Individual believers are The Church. This is an unbelievably powerful statement. With Jesus as the Head and us as his body on earth there is nothing that can stand against us. No, I don't mean that we believers should take over governments or dare them to take over us. Rather, the privilege of being Jesus' body on earth is infused with such Godly power that a child of God cannot be compelled by any outside force to renounce his or her Savior. Even better, we get to help others know Jesus so that they, too, can rest in this same assurance. It is worth our time to study the Church. By “Church” I mean the organic, world-wide collection of children of God. I do not mean any denomination, SDA or otherwise. Parts of this lesson are applicable to all Jesus followers; parts are not. The lesson begins with a negative comparison – Is Jesus or Peter the rock? I suppose this might be necessary given the number of Catholics who join the SDA church, but I think the lesson should have started with the second half of Sunday's topic. Why argue against Catholicism? Most of their theology is wrong. Why waste time with it? It doesn't matter that they are so large and wield so much influence in the world. God could care less about size and worldly influence. Why not argue solely for Jesus, rather than against some other church? Thankfully, the second half of today's lesson introduces this position of strength. Only human-devised organizations and structures appear feeble. If Jesus is the foundation and our head, then the Church is not feeble. It is victorious. Only when we fix our eyes on each other do we see weakness and failure. But we are told to fix our eyes on Jesus, the author and completer of our faith. He is sufficient. A thinly veiled reference to the Roman Catholic church is not the best place to start a lesson regarding the Church. As the lesson properly states in the various Bible passages quoted, Jesus is the foundation, the only possible foundation, of the Church. Ignore Catholicism. Ignore Adventism. Ignore all other -isms. Fix your eyes on Jesus and rejoice that you are part of his body on earth. So, the real reason for this lesson is to seek unity within the Seventh-day Adventist denomination. I don't know what is going on within Adventism, but it must be serious enough to focus Monday-Thursday on unity. “All” can mean only all believers in Jesus Christ. These are the called out ones (ecclesia). These are the ones who are moving from victory to victory, led by the Holy Spirit, walking by faith in the finished work of Jesus and absolutely certain of their future when he does away with all vestiges of evil and recreates the heavens and the earth. So, instead of reading John 17 with an eye towards SDA unity, read it for what Jesus actually said. I mean that literally. Read it yourself right now. The fact is, the kind of unity Jesus prays for does happen spontaneously, organically. It is not the result of human effort, but the direct result of the indwelling Holy Spirit. Only when we couch our beliefs in the context of human organizations does unity suffer. On the other hand, when we offer ourselves to him as living sacrifices (not dead ones) the Spirit renews our minds (See Romans 12). Do we see disunity sometimes even within the Church? Yes. And it is always the result of trying to accomplish something in our own strength instead of by faith. This is not a cause for weeping, but for thankfulness. It is another opportunity to allow the Spirit to teach, another opportunity to praise Jesus for his ongoing forgiveness, another opportunity to reflect on what it means to be his child. Unity is not something Jesus prayed for that we could fuss and fret and stress and strain about in our organizations. Jesus prayed unity over us. Our unity is the result of his prayer, the guaranteed result of our being fellow heirs with him. Behind the completely sensible call to contemplate Jesus' prayer in John 17 is the realization that something is amiss within Adventism. Whatever is amiss will not be solved by misapplying John 17. Allow Jesus to speak for himself. Allow the Holy Spirit within you to interpret and apply Jesus' words. These two statements are winsome, but subtly incorrect. Second, mind and heart can work together all they want, but that doesn't ensure unity. In my view of humanity, the mind and heart are part of the soul (mind, emotions and will). To obtain the laudable goal described in today's lesson requires the indwelling Holy Spirit. He renews our minds, which in turn informs our wills, which in turn allows our emotions to respond properly. When two or more children of God relate to each other out of this Spirit-led reality, unity happens. In the third paragraph the author writes, “This love is not a temporary emotion or feeling but a living and permanent principle of action.” I completely agree. Why, then, in the statement quoted above does he equate the love necessary for unity with emotions (the heart)? You can't have it both ways. I think that spending time in the John 15 passage might have prevented this confusion. He suggested reading it, but then never referred back to it in his commentary. Perhaps it was edited out. One of the key phrases in John 15 is, “for apart from Me you can do nothing.” (Verse 4) How much unity can we arrive at apart from Jesus? None! This means that perfect beliefs are inadequate, as the author correctly asserts. The reason for this is that unity is a matter of relationship, not proposition. First the individual's relationship must be in Christ. Only then can two or more people in Christ take the risks inherent in relationship. I also agree with the author that a false focus on love, which results in sentimentality, plagues especially those churches that are trying to win unbelievers without offending them. Everything about Jesus is offensive to self righteousness, but that offense, when allowed to do its work, results in salvation. Sentimentality never can do that. Living in the Spirit is the only way to avoid the twin threats identified by the author. The Spirit is Jesus' provision for unity. I agree with much the author wrote in this day's commentary. However, he tripped over his own proper argument. Live in the Spirit. What Jesus described in John 15 solves the problem. I assume criticism is one of the problems ailing the Adventist church. This is a fair assumption because it afflicts all churches. I work for a ministry that teaches the grace of God. What could be less critical than that? I am as subject to this fleshly reaction as anyone else. In fact, you never read my first draft response to these Sabbath School lessons. I read and critique my attitude several times. More important, my wife reads and critiques my attitude. Nothing is to be gained by just throwing napalm on everyone. Again, Jesus is offensive enough. I'm am learning to more adequately present his sufficiency instead of merely poking holes in someone else's argument. I wish the author had said, “Our aim, however, is not to compare ourselves with others but to bring them to Jesus, to restore them gently.” I agree that comparing myself to Jesus is a valuable personal growth exercise from time to time, but what Jesus asks me to do is to spend far more time contemplating what he has accomplished for me and will continually accomplish in and through me throughout my life. This is a nit. Wednesday's lesson is presented very well. Criticism truly is one of the great obstacles to unity. The author has done a nice job of laying out the issues – truth, edification and love. I am as subject to this problem as anyone else. It was valuable to be reminded of this. I apologize to those I have unduly hurt in my previous commentaries. My goal has been to present the truth of Jesus. In the context of Adventism this often means disagreeing in specific ways. To the extent my writing has not been edifying and loving, the fault is mine. Here is one of those places where I must be edifying and loving while disagreeing in a pointed manner. According to passage after passage in the New Testament, nothing, absolutely nothing, compromises my relationship with God. All kinds of things compromise my relationship with others, but I am forever in God's hand – completely safe, completely secure. This is perhaps my greatest disagreement with the Advent belief system. At nearly every turn, it reminds you that this or that thing will cause you to be lost. You live under the constant threat of disappointing Jesus. Honestly, we humans simply do not possess the power to do such things. So, it seems that the author's commentary in the Standard Edition is quite different from the goals of the Teachers Edition, at least in the second two-thirds of Thursday's lesson which focus on reconciliation. The first third falls into a classic mistake. Clearly, Jesus told people in Matthew 5 and 6 that you must forgive in order to be forgiven. Just as clearly, we're told in Ephesians 1:7 and Colossians 1:13, 14 that in Jesus we have redemption, the forgiveness of sins. If we already have forgiveness as the result of our relationship with him, then we don't need to ask for more of it. What changed between Matthew and the Pauline letters? Jesus happened. In his death he became sin for us so that we might become the righteousness of God in him. In his resurrection he provided salvation; that is, life (see Romans 5). Prior to his death, burial and resurrection people were limited to what God provided in the Mosaic covenant. This was a blessing, truly, but it was insufficient to the need of humanity. Only in Jesus, the fulfillment of the Mosaic covenant, can we enter into the New Covenant, which God makes with himself so it cannot fail, and receive the benefits afforded to co-heirs with Jesus. Therefore, Jesus, who was born under Law, also taught under Law even as he prepared for his great victories over sin and death which freed us from the Law. I'm just not certain that the author of this week's lesson also is the author of the Teachers Edition. The two are very different in tone and goals. 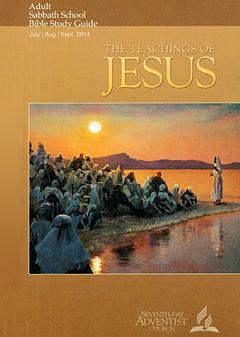 The Teachers Edition argues for “compromising” our relationship with Jesus. Thursday's lesson talks about the need for restoration and reconciliation when we come into conflict with others. Although I disagree with the application of Matthew 5 and 7 in Thursday's context, I do agree with the author's identification of attitude as the primary obstacle to or enabling of restoration and reconciliation. I tried for many years to “fix” the Adventist church. Back in the days of the so-called Davenport Affair I worked hard to get those I thought to be perpetrators out, replacing them with men of honest character. I talked with others who cared as much as I did about the church. I read widely of both Adventist history and current events. Two things happened to change my life. First, I interned under Walter Rea just before he published his findings into Ellen White's use of sources. My wife and I recorded his presentations and sent copies around the world. Before you roll your eyes and browse to some other site, hear me out. If you could see the color-coded proof found in Edersheim, Hannah and many others as I did your faith would be shaken as mine was. This caused me to begin a long re-examination of my beliefs. What is truth? Second, I came to realize that I had become the legalist's legalist. During my examination of beliefs I read many passages that challenged my existing theology, but I still figured it was mostly a matter of refinement rather than revolution. When I finally ran across 2 Corinthians 3 for the first time (literally, I had never read it before), it stopped me dead in my tracks. I had to identify myself as one who was wearing the veil of Law and that I would never be able to see until Jesus took the veil away. In turn, this led to a study of the New Covenant, forgiveness and eternal life. I discovered that the unity I sought and the peace I craved could be found in Christ alone. I could no longer honestly remain a Seventh-day Adventist. I knew this a couple of years before I resigned my membership, but I carried so much anger and guilt that God would not let me leave before dealing with it. When I discovered my identity in Christ the anger and guilt drained away. This allowed me to leave peacefully instead of with scorched earth. It also allows me to relate to others of different belief systems with love and grace. I no longer am trying to find the perfect belief system. I've found Jesus. More accurately, he won me to himself. I no longer worry (that much) about unity. I've found it in Jesus, along with many, many others for whom Jesus is more important than denominational affiliation. Unity is possible, because Jesus is sufficient. Even more, unity is guaranteed because Jesus is sufficient! Copyright 2014 BibleStudiesForAdventists.com. All rights reserved. Revised August 17, 2014. This website is published by Life Assurance Ministries, Camp Verde, Arizona, USA, the publisher of Proclamation! Magazine. Contact email: BibleStudiesForAdventists@gmail.com.